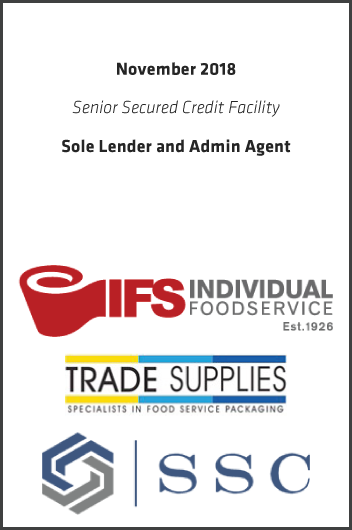 AB Private Credit Investors (“AB-PCI”) acted as administrative agent and sole lender of a senior credit facility to support the merger of Trade Supplies, LLC (“Trade Supplies”), a portfolio company of Sole Source Capital (“SSC”), and Individual FoodService (“IFS”). The combined company creates one of the largest non-perishable foodservice distributor and packaging solution providers in California. AB-PCI leveraged its expertise and knowledge in the foodservice distribution and restaurant end-market industries to quickly and efficiently deliver a flexible structure. With over 130 years of combined operating history, the combined company will distribute eco-friendly and custom-branded packaging, paper and plastic disposables, unique catering items, food products, janitorial supplies, healthcare facility products and other foodservice smallwares and equipment to its more than 5,000 weekly customers, which include fast casual, family-owned and major chain restaurants, food processors, caterers, bakeries, schools, large public venues, hospitals, healthcare facilities and foodservice distributors. Founded in 2016 by David Fredston and an experienced group of private equity professionals, Sole Source Capital is an operationally-focused lower-middle market investment firm that targets investments in manufacturing, distribution, and industrial service companies. This announcement is not a recommendation of, or offer to buy or sell any security or financial instrument. If you, as the intended recipient of this message, the purpose of which is to inform and update our clients, prospects and consultants of developments relating to our services and products, would not like to receive further e-mail correspondence from the sender, please go here to Unsubscribe. To view this e-mail as a web page, please go here. 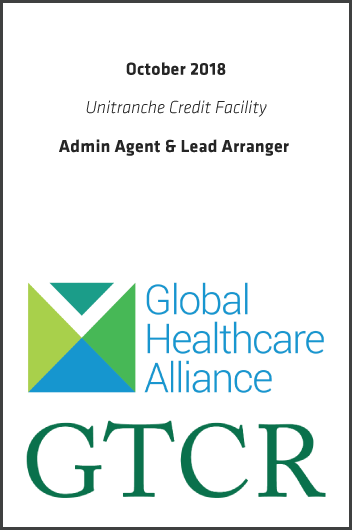 AB Private Credit Investors (AB-PCI) provided a unitranche credit facility to support GTCR-backed Cedar Gate Technologies, acquisition of Global Healthcare Alliance. AB-PCI leveraged its healthcare and IT expertise to deliver an efficient financing solution. GTCR is a leading private equity firm focused on investing in growth companies in the Financial Services & Technology, Healthcare, Technology, Media & Telecommunications and Growth Business Services industries. The Chicago-based firm pioneered The Leaders Strategy™ – finding and partnering with management leaders in core domains to identify, acquire and build market-leading companies through transformational acquisitions and organic growth. Since its inception, GTCR has invested more than $15 billion in over 200 companies. 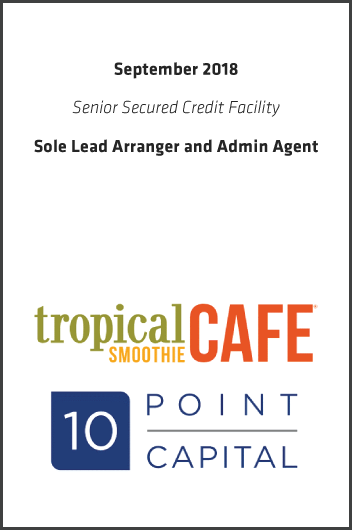 AB Private Credit Investors (AB-PCI) acted as administrative agent and sole lead arranger of a $53.5 million senior credit facility to recapitalize Tropical Smoothie Café, a portfolio company of 10 Point Capital. AB-PCI leveraged its strong expertise and knowledge in the restaurant and franchising industries to quickly and efficiently deliver a flexible senior credit facility. Comvest Credit Partners acted as Documentation Agent on the transaction. Founded in 1997, Tropical Smoothie Café franchises a chain of 712 fast casual restaurants in 43 states serving signature smoothies, sandwiches, flat breads and salads and is the third largest smoothie concept restaurant in the country. 10 Point Capital is an independent private equity firm located in Atlanta, GA. 10 Point has a 20+ year proven track record of accelerating growth and profitability for multi-unit and franchise brands. 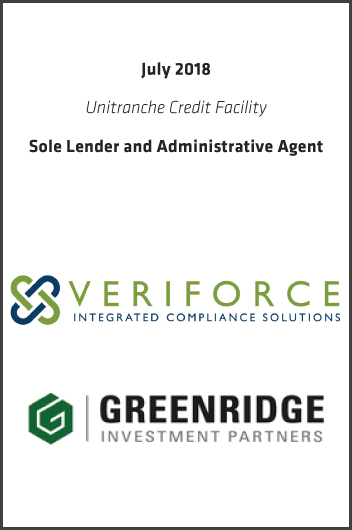 AB Private Credit Investors™ (“AB-PCI”) recently closed a unitranche credit facility to recapitalize Veriforce, a portfolio company of Greenridge Investment Partners. AB-PCI delivered a flexible structure by utilizing its expertise in structuring transactions for high growth software providers. Veriforce is a leader in regulatory compliance and contractor management solutions for oil and gas companies. Their services include: Operator Qualification (OQ), drug & alcohol testing, computer based training, and contractor safety management. They are the only OQ service provider that verifies, audits, and has complete documentation for all the necessary compliance records. Greenridge Investment Partners is a private equity firm located in Austin, TX. Greenridge invests in leading middle-market businesses with attractive growth characteristics and proven track records of profitability. 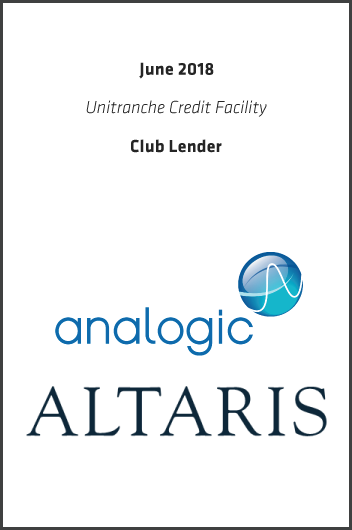 AB Private Credit Investors (AB-PCI) provided a $100 million commitment to a unitranche credit facility supporting Altaris Capital Partners’ acquisition of Analogic Corporation (NYSE: ALOG). AB-PCI leveraged its healthcare expertise to effectively deliver a meaningful commitment to the financing facility. Analogic provides leading-edge healthcare and security technology solutions to advance the practice of medicine and save lives. Analogic is recognized around the world for advanced imaging and real-time guidance technologies used for disease diagnosis and treatment as well as for automated threat detection. Altaris Capital Partners is an investment firm focused on the healthcare industry. Altaris actively manages $2.4 billion of equity capital and invests in businesses that deliver value to the healthcare system by improving patient outcomes, eliminating unnecessary costs, increasing efficiency and aligning stakeholder incentives. Since inception in 2003, Altaris has made 35 platform investments and has worked closely and collaboratively with the management teams of its portfolio companies to support growth and capital appreciation. 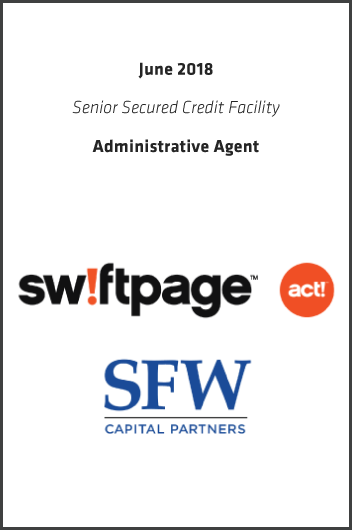 AB Private Credit Investors (AB-PCI) acted as Administrative Agent and Sole Lender for a senior secured credit facility to support SFW Capital Partners’ acquisition of Swiftpage. Swiftpage, with operations in Denver, CO, Scottsdale, AZ, and Newcastle, UK, is a leading provider of software and services that help small and mid-sized businesses grow. Swiftpage is the maker of Act!, the pioneer and an innovator in the CRM space, serving over 500,000 users in over 100 countries. The award winning solution makes it easy for small businesses to grow with powerful sales and marketing tools and a flexible CRM platform. SFW Capital Partners is a specialized private equity firm that invests in mid-sized companies across the information value chain, with a particular focus on information, software, and analytical instrumentation, a sector that the principals of SFW have invested in for over 20 years. SFW’s businesses manage and provide information, analytics, and workflow solutions that support critical decision-making and knowledge transfer processes across all major industries and business functions. 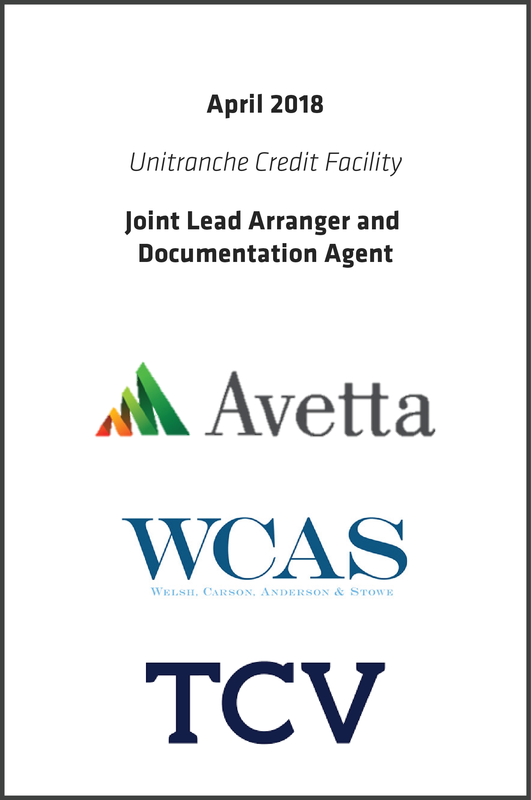 AB Private Credit Investors (AB-PCI) acted as Joint Lead Arranger and Documentation Agent for a unitranche credit facility to support Welsh, Carson, Anderson, and Stowe (WCAS) and Technology Crossover Venture’s (TCV) acquisition of Avetta. Avetta provides cloud-based supply chain risk management software that allows enterprises to more effectively manage and qualify service providers performing activities across their global operating sites. The company’s platform connects over 220 enterprise clients to over 55,000 service providers across 100 countries. WCAS focuses its investment activity in two target industries: technology and healthcare. Since its founding in 1979, WCAS has organized 16 limited partnerships with total capital of over $22 billion. 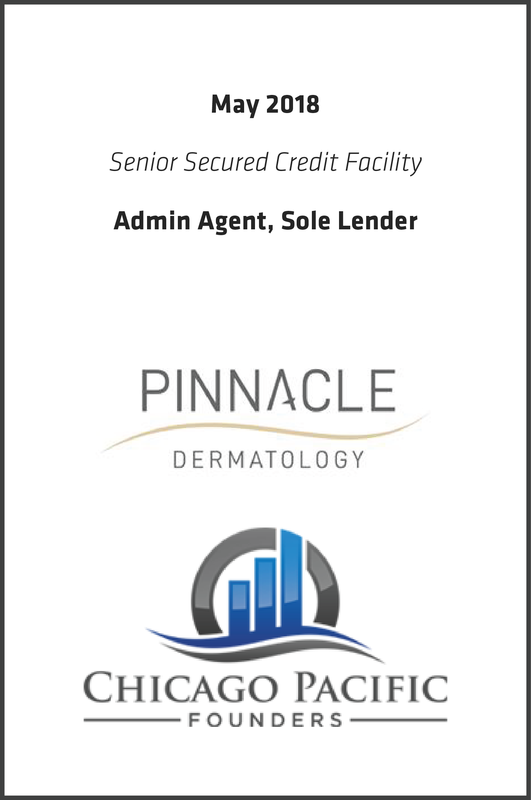 AB Private Credit Investors (“AB-PCI”) provided a $75,000,000 senior secured credit facility to support multiple add-on acquisitions and future growth capital initiatives by Pinnacle Dermatology, a portfolio company of Chicago Pacific Founders. AB-PCI leveraged its experience and knowledge of healthcare practice management and multi-site businesses to deliver a facility tailored to meet the specific demands of the platform, including availability for significant further add-on and de novo growth. Pinnacle Dermatology delivers a comprehensive suite of medical, surgical, cosmetic and pathology lab services to patients throughout the Midwest. Pinnacle’s shared services infrastructure supports each acquired and de novo practice with operational, revenue cycle management and marketing services to maximize the patient experience. Chicago Pacific Founders is a leading middle market private equity firm exclusively focused on investments in the healthcare services sector. 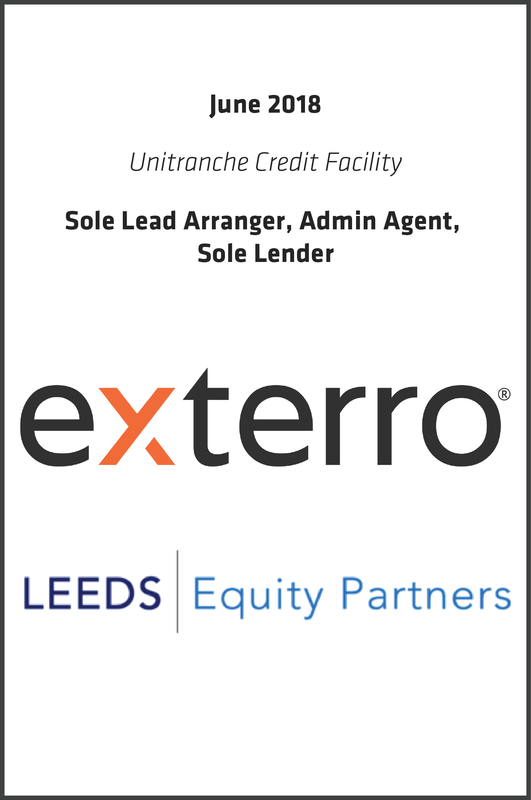 AB Private Credit Investors (AB-PCI) acted as Sole Lead Arranger and Administrative Agent for a unitranche credit facility supporting Leeds Equity Partners’ acquisition of Exterro. AB-PCI leveraged its considerable experience in investing in technology businesses serving the legal and professional services end markets to deliver a unique financing solution. Exterro is a leading provider of e-discovery software designed for legal and IT teams at Global 2000 and AmLaw 200 organizations. Exterro's e-discovery and information governance software integrates with existing IT, HR and legal systems to deliver complete visibility into all critical data required for managing information assets more efficiently. Leeds Equity Partners is a sector-focused private equity firm dedicated exclusively to partnering with management teams in the education, training, software and information services industries. Leeds has invested over $2.6B of capital across its portfolio companies in its twenty-year history. 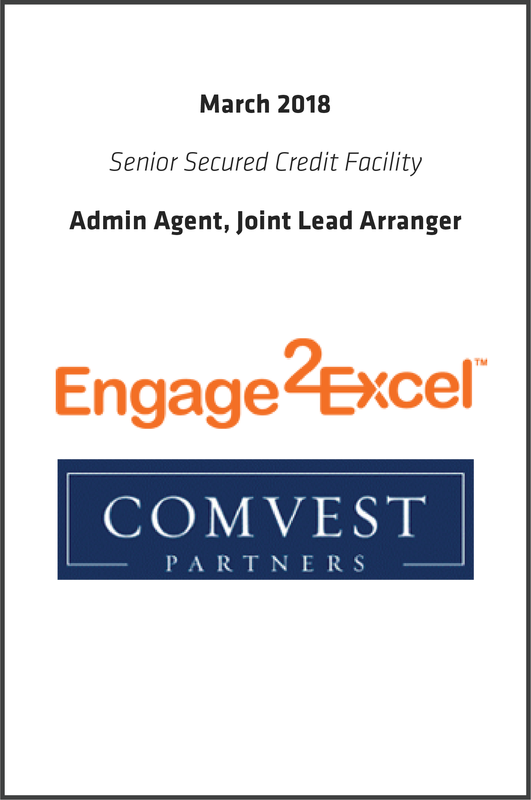 AB Private Credit Investors (AB-PCI) acted as Administrative Agent and Joint Lead Arranger for a senior credit facility to support Comvest Partners’ acquisition of Engage2Excel (“E2E”). E2E is a leading provider of employee recognition, sales incentives, talent acquisition and consumer loyalty solutions and services. Headquartered in Statesville, North Carolina, E2E’s solutions focus on attracting, retaining, and engaging both employees and customers to increase productivity and profitability. E2E maintains relationships across a diversified client base ranging from Fortune 100 companies to small and medium-sized businesses. Comvest Partners is a private investment firm providing equity and debt capital to middle-market companies across North America. Comvest’s funds have over $3.1 billion of assets under management. AB Private Credit Investors as Co-Lead Arranger and Administrative Agent, upsized its existing $120 million credit facility to $200 million. Proceeds from the upsize will help finance the continued development of Caprock’s gathering and processing assets. AB-PCI leveraged its experience and knowledge of the energy industry to deliver capital availability for significant future growth. 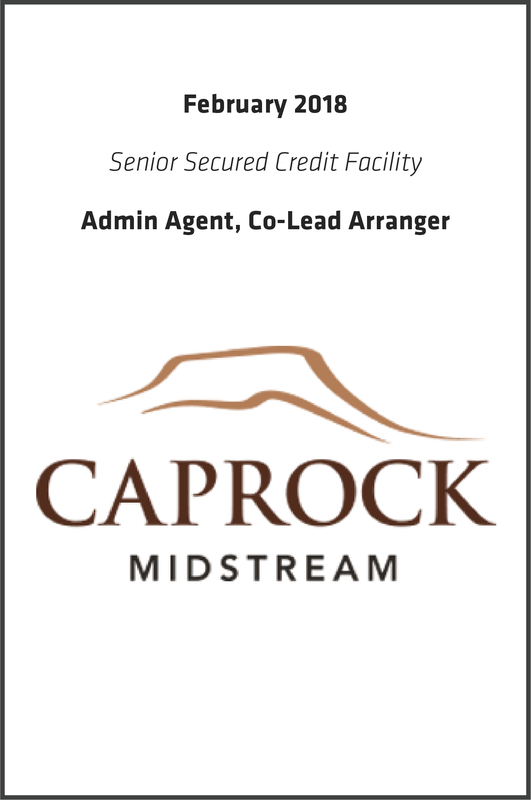 Caprock Midstream provides natural gas gathering, processing, oil gathering, water gathering and water disposal in the Delaware Basin, and was founded in 2015 through a partnership with Energy Spectrum Partners VII, LP. Energy Spectrum Partners VII is the latest fund of Energy Spectrum Capital, a leading private equity firm that has raised over $3.5 billion since inception in 1996 focused exclusively on the energy industry. 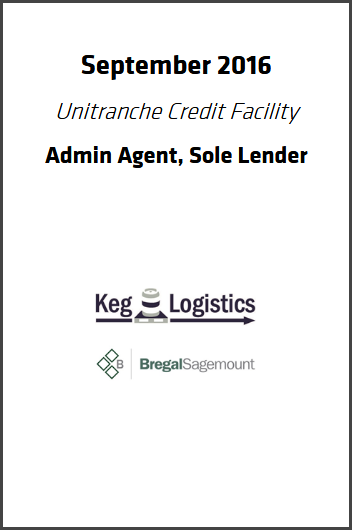 AB Private Credit Investors (AB-PCI), as Sole Arranger and Administrative Agent, upsized its existing $100 million credit facility to $177 million in support of Keg Logistics acquisition of Keg Credit. AB-PCI utilized its scale and flexibility to solely deliver a fully underwritten solution to support this transformative acquisition. Prior engagements with Keg Logistics include Seaport Capitals original acquisition of the company in a change of control transaction and its earlier purchase of Atlas Keg. Keg Logistics is owned by Seaport Capital. Seaport Capital invests in middle market companies with recurring revenue business models in the communications, business services and media sectors. 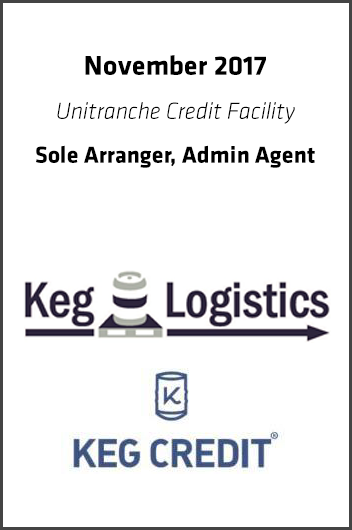 Keg Logistics is a leading provider of keg financing and management services to over 2,000 craft breweries and wineries globally. Started by industry veteran Chris Sapyta, Keg Logistics enables its customers to maximize their growth and profitability through flexible keg supply options. In addition to keg financing, Keg Logistics also manages domestic and international logistics, including 3PL logistics support. 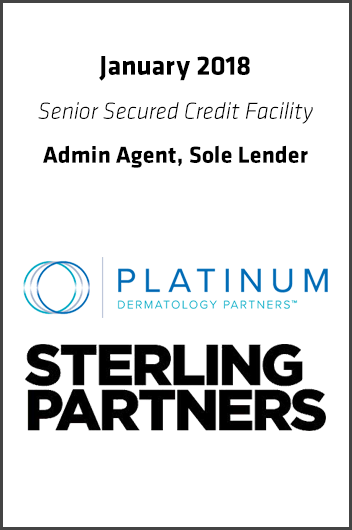 AB Private Credit InvestorsTM ("AB-PCI") provided a $77,000,000 senior secured credit facility to support multiple add-on acquisitions and future growth capital initiatives by Platinum Dermatology, a portfolio company of Sterling Partners. Platinum Dermatology provides practice management services to dermatology groups offering medical and cosmetic services. About Company: Sterling Partners is a Chicago based private equity firm with deep expertise investing in middle market growth opportunities in the healthcare services and business services industries. AB Private Credit InvestorsTM ("AB-PCI") jointly led a unitranche credit facility to support CVC Growth Fund's acquisition of VelocityEHS. VelocityEHS is the leading global provider of cloud-based environment, health and safety ("EHS") software. Its comprehensive software platform and innovative mobile solutions aim to make enterprise-level EHS functionality accessible and affordable to businesses of all sizes, helping them efficiently meet complex compliance and regulatory challenges. About Company: CVC Growth Fund focuses on middle-market, high-growth companies in the software and technology-enabled business services sectors. The fund primarily targets equity investments between $50 million and $200 million in North America and Europe. 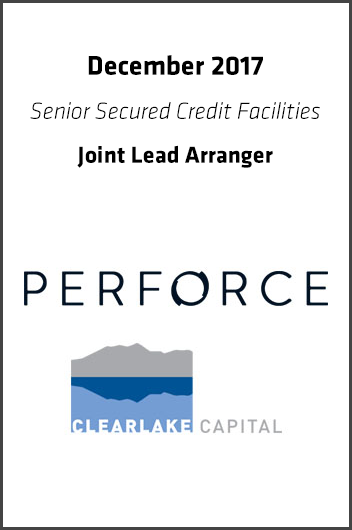 AB Private Credit Investors ("AB-PCI") recently acted as Joint Lead Arranger for senior secured credit facilities to support Clearlake Capital's acquisition of Perforce. AB-PCI was able to quickly deliver a commitment and close on the facilities by utilizing its software industry expertise and structuring flexibility. Perforce is a leading provider of enterprise scale software solutions to technology developers and development operations ("DevOps") teams requiring productivity, visibility and scale during all phases of the development lifecycle. Enterprises across the globe rely on its agile project management, developer collaboration, version control and repository management solutions as the foundation for successful DevOps. About Company: Clearlake Capital Group, L.P. is a leading private investment firm founded in 2006. The firm's core target sectors are software and technology-enabled services; industrials and energy; and consumer. AB Private Credit Investors (AB-PCI) acted as Administrative Agent and Sole Lead Arranger for the funding of a $60 million senior credit facility to support Oak Lane Partners recapitalization of D1M Holdings ("D1M"). D1M provides third-party maintenance, IT infrastructure optimization, and a full suite of managed services to Fortune 1000 companies for data center and other business environments. The company provides managed service IT solutions that include hardware maintenance, asset lifecycle management, warranty support, help desk, print management, cloud migration, storage optimization, and security management, among others, largely with its own captive W-2 workforce. D1M is headquartered in Wayne, PA and has a global presence with operations on five continents. About Company: Oak Lane Partners is a private investment firm that has significant experience acquiring businesses and working with management teams to create meaningful value. 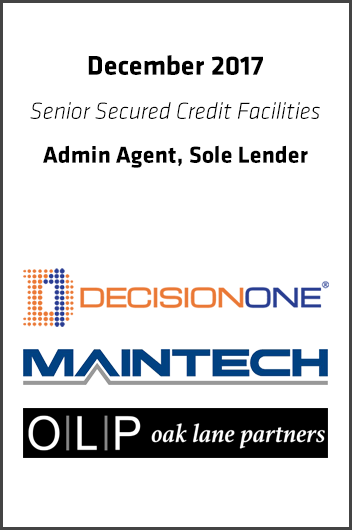 Oak Lane Partners invests capital in numerous industries across North America. 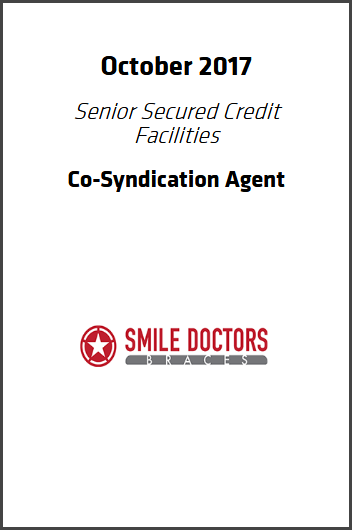 AB Private Credit InvestorsTM ("AB-PCI") joined incumbent and new lenders as co-syndication agent for $325,000,000 of senior secured credit facilities provided to support Linden Capital Partners in its acquisition of Smile Doctors. AB-PCI leveraged its strong expertise and knowledge in the healthcare/dental sector to quickly and efficiently deliver a commitment to the facilities in partnership with Twin Brook Capital Partners as agent. "Smile Doctors' scale and unique concept that emphasizes the patient experience delivers a strong value proposition to its customers and employees," said Daniel Weiss of AB-PCI, "We are excited to help finance the acquisition and support management as they enter the next phase of growth." About Company: Smile Doctors is a specialty dental services organization focused on supporting orthodontists to provide high quality, corrective dental procedures in a friendly, patient-focused, service-oriented environment. Smile Doctors supports orthodontists in over 90 locations across eleven states. 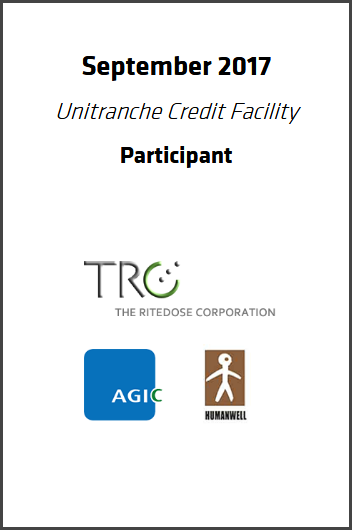 AB Private Credit InvestorsTM ("AB-PCI") participated in a unitranche credit facility led by MidCap Financial to support the AGIC and Humanwell led acquisition of The Ritedose Corporation ("Ritedose"). AB-PCI leveraged its healthcare expertise to quickly deliver a meaningful commitment to the financing facility. "As a market leader with a strong, high quality reputation, Ritedose is attractively positioned in the pharmaceutical manufacturing space to capitalize on favorable industry trends" noted Jay Ramakrishnan, Managing Director of AB-PCI. "We are excited to work with AGIC, Humanwell, MidCap and Ritedose and look forward to helping the Company continue its strong growth." About Company: Ritedose is a leader in blow-fill-seal (BFS) manufacturing of inhalation products, eye drops, eardrops, and unit dose oral liquids on behalf of its customers and under its own label. 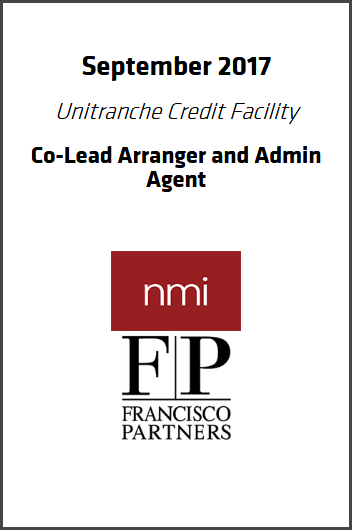 AB Private Credit InvestorsTM ("AB-PCI") recently closed a unitranche credit facility to support Francisco Partners' investment in NMI. AB-PCI quickly and efficiently provided a commitment by utilizing its expertise in underwriting software and payments businesses. NMI provides payments enablement technology that empowers ISOs, VARs, ISVs and payment facilitators to offer branded payment gateway services without building or maintaining their own technology. NMI serves over 1,000 affiliates and 100,000 merchants. About Company: Francisco Partners is a leading global private equity firm, which specializes in investments in technology businesses. Since its launch over 17 years ago, Francisco Partners has raised over $10 billion in capital and invested in more than 200 technology companies, making it one of the most active and longstanding investors in the technology industry. The firm invests in opportunities where its deep knowledge and operational expertise can help companies realize their full potential. 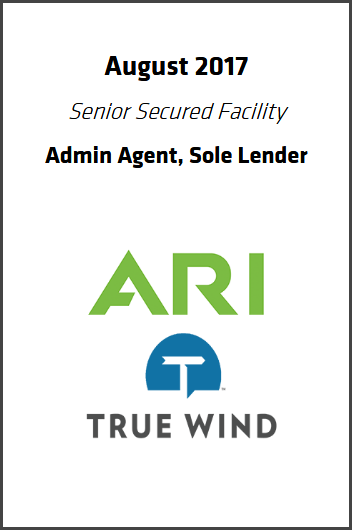 AB Private Credit InvestorsTM ("AB-PCI") recently closed a unitranche credit facility to support True Wind Capital's acquisition of ARI Networks Services Inc ("ARI"). AB-PCI quickly and efficiently delivered a fully underwritten financing solution by utilizing its software industry expertise and structuring flexibility. AB-PCI was the sole lender on the transaction and invested alongside True Wind Capital in the equity as well. ARI offers an award-winning suite of SaaS, software tools and marketing services to help more than 23,500 equipment dealers, 195 distributors and 3,360 brands Sell More Stuff!TM - online and in-store. True Wind Capital is a San Francisco-based private equity firm managing $560 million. True Wind is focused on investing in leading technology companies. True Wind is a value-added partner, providing support and expertise that is rooted in 50+ years of collective investing experience. 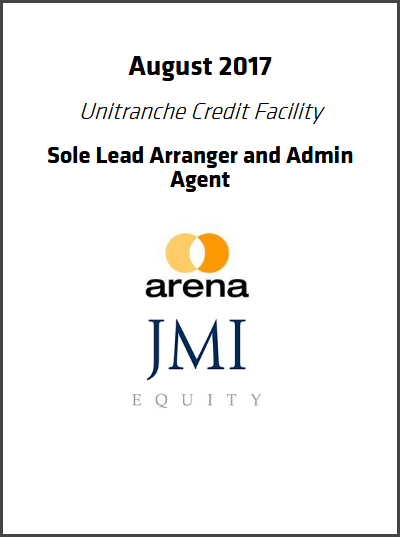 AB Private Credit InvestorsTM ("AB-PCI") recently closed a $45 million unitranche credit facility to support JMI Equity's investment in Arena Solutions. AB-PCI delivered a customized, fully underwritten financing solution by utilizing its software industry expertise and structuring flexibility. Arena is a leader in SaaS applications for the product development market, particularly in the technology, electronics, and life sciences verticals. Arena pioneered a cloud-based, all-in-one product development platform that unites product lifecycle management, application lifecycle management, supply chain collaboration and quality management systems. JMI Equity is a growth equity firm focused on investing in leading software companies. Founded in 1992, JMI has invested in over 130 businesses in its target markets, successfully completed over 85 exits, and raised more than $3.0 billion of committed capital. JMI partners with exceptional management teams to help build their companies into industry leaders. "The AB-PCI team was very helpful and responsive throughout the process," said Brian Hermelin, Managing Partner, Rockbridge Growth Equity. "Their experience in financing high-growth businesses and ability to deliver a flexible solution enables Rockbridge and Kings III's management to help the company with its continued growth and expansion." The credit facilities also provide committed funding to support new customer growth. 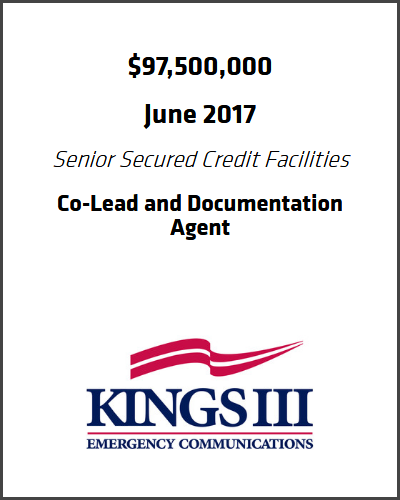 Kings III's subscription-based, turn-key monitoring solution is uniquely positioned to capture share in the emergency communications market. About Kings III: Kings III designs, manufactures, installs and provides 24/7 monitoring service for emergency telephones, primarily in elevators and pool facilities. The company was founded in 1989 and is headquartered in Dallas, TX. AB Private Credit Investors ("AB-PCI") acted as sole lead arranger and serves as administrative agent for $75,500,000 of senior secured credit facilities provided to Vision Media ("Vision"). Proceeds from the facilities were used to refinance Vision's existing indebtedness and provide committed capital for multiple growth initiatives. Vision, headquartered in Valencia, CA, is the premier provider of digital and physical asset management solutions to entertainment studios and consumer product companies. Vision's fulfillment and distribution services, coupled with its innovative software platforms, including industry-leading asset management sites and content distribution apps, are instrumental to its clients' success. 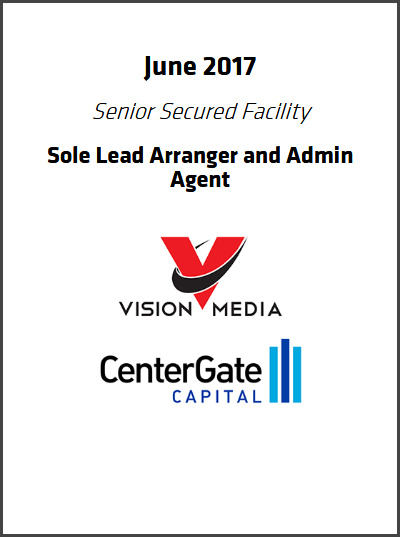 Vision is a portfolio company of CenterGate Capital ("CenterGate"). CenterGate is a private equity firm focused on investing in lower middle market companies with under $250 million of revenue. In order to realize their potential, these companies need flexible capital, strategic guidance and strong management teams. CenterGate brings together a balance of transactional and operational experience along with a network of advisors and strategic relationships which provide its portfolio companies with exceptional resources. AB Private Credit InvestorsTM ("AB-PCI") recently closed on a unitranche credit facility to support Strattam Capital and its portfolio company, Contegix(r), in the acquisition of BlackMesh, a managed IT services provider specializing in web content management application hosting and secure compliance solutions. AB-PCI quickly and efficiently delivered a fully underwritten financing solution by utilizing its industry expertise and structuring flexibility. Adrian Polak, Co-Founder and Managing Partner at Strattam Capital, commented: "AB-PCI's experience in financing data center, application hosting and related IT services businesses was really valuable during this transaction. 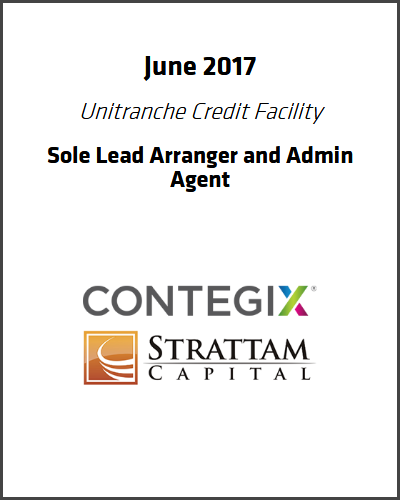 They embraced Contegix's value proposition and executed efficiently and quickly to deliver a fully underwritten solution. We look forward to continue scaling Contegix with support from AB-PCI's flexible and sizeable capital base." "Contegix is uniquely positioned in the application lifecycle management space with cloud and hybrid offerings to capitalize on favorable industry trends," noted Patrick Fear, Managing Director of AB-PCI. "We are excited to partner with Strattam and Contegix and look forward to helping the Company continue its strong growth." About Contegix: Contegix(r) provides cloud, application lifecycle management, infrastructure and managed services to all markets from start-ups to enterprises. 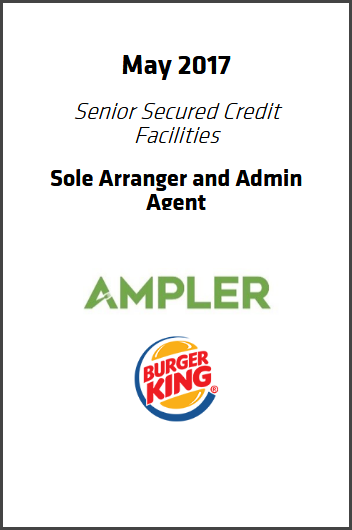 AB Private Credit InvestorsTM ("AB-PCI") acted as sole arranger and serves as admin agent for $33,000,000 of senior secured credit facilities for Ampler Burgers LLC ("Ampler"), a franchisee of 42 Burger King restaurants in Texas and New Mexico. Ampler is a growth-oriented franchisee with significant area development agreements, and the credit facilities provide committed funding to support new unit growth as well as upgrades of existing units. Investment firm, Agman, created Ampler by acquiring the assets of a leading franchisee of Burger King restaurants. Kevin Fernandez will serve as President of Ampler and Steve Wiborg will serve as Executive Chairman. About Ampler: Ampler is one of the largest franchisees of Burger King restaurants in Texas and New Mexico with 42 units and development rights to build new units across Texas, including the Central Texas, El Paso and Laredo regions. About Agman: Agman is a family owned, multi-strategy investment firm based in Chicago. Agman participates as a control and passive investor across a range of industries and business types and is organized into three areas: Real Estate, Private Capital and Public Markets. AB Private Credit InvestorsTM and its affiliates ("AB-PCI") announced a $120 million credit facility co-lead and co-arranged with Goldman Sachs Specialty Lending Group ("GSSLG") to Caprock Midstream, LLC ("Caprock"). The facility will be used to fund the continued growth of Caprock's Delaware Basin buildout. 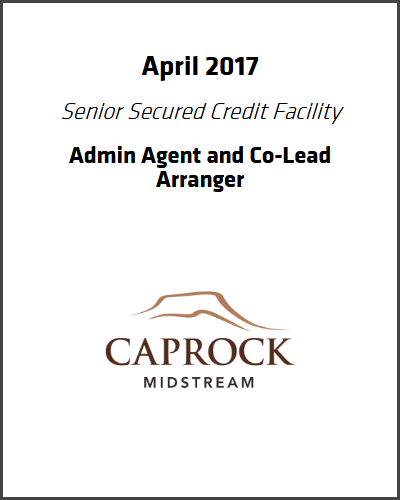 "This financing provides Caprock with the additional capital required to continue the development of our assets in the Delaware Basin in advance of our customers' needs" said Mike Forbau, CEO of Caprock Midstream. Patrick Gimlett, a Director who leads AB-PCI's origination efforts in energy added, "Midstream infrastructure is a key area of specialization for us and we are excited to have brought our industry knowledge, structuring expertise and flexibility to bear in this transaction." The transaction highlights AB-PCI's ongoing effort to provide capital to energy sector participants that possess high quality assets that are supported by attractive long-term fundamentals. About Company: Caprock provides natural gas gathering, processing, oil gathering, water gathering and water disposal in the Delaware basin. Caprock was founded in 2015 through a partnership with Energy Spectrum Partners VII, LP. 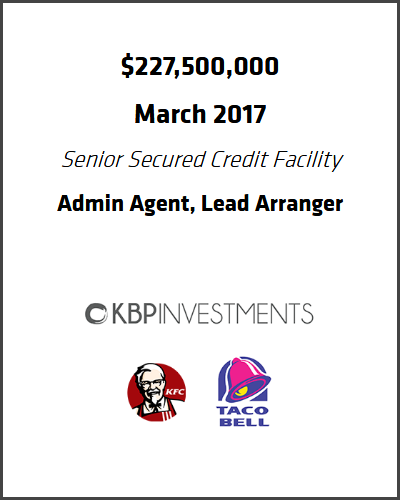 AB Private Credit Investors ("AB-PCI") closed an upsizing of its senior secured credit facility for KBP Foods ("KBP"), from $146,500,000 to $227,500,000. The increased commitments funded a recent acquisition of 85 KFC and Taco Bell restaurants in Louisiana, Oklahoma, Arkansas, Alabama, Tennessee and Ohio. The credit facility also provides capital for future growth. In 2016, KBP acquired 91 restaurants, and it expects to acquire additional restaurants during the rest of 2017. The company now operates 450 restaurants in 20 states. Michael Kulp, President and CEO of KBP said, "We remain focused on strategic growth that creates value for our business and career advancement opportunities for our employees. AB-PCI has shown itself to be a financial partner that's capable of supporting this growth. This credit facility provides us with the funding we need to continue to execute our business plans." 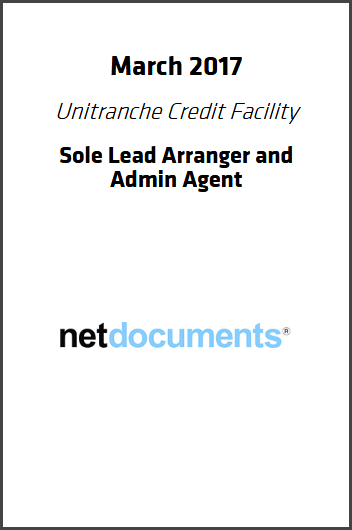 AB Private Credit Investors ("AB-PCI") recently closed on a unitranche credit facility to support Clearlake Capital Group's acquisition of NetDocuments. AB-PCI was able to quickly deliver a fully underwritten financing solution by utilizing its software industry expertise and structuring flexibility. Behdad Eghbali, Managing Partner at Clearlake Capital Group, commented "AB-PCI's experience in financing high-growth software businesses and its ability to deliver a fully underwritten solution allows us to position NetDocuments to become an industry consolidator. Going forward, the credit facility provides the Company the flexibility to maintain growth and create value." "NetDocuments is uniquely positioned in the legal document management space to capitalize on favorable industry trends," noted Drew Miller, Director of AB-PCI. "We are excited to partner with Clearlake and look forward to helping the Company continue its strong growth." About Company: NetDocuments is a provider of cloud-based document management solutions for the legal industry, serving both law firms and corporate legal departments. AB Private Credit Investors (AB-PCI) provided a senior secured, unitranche credit facility to support H.I.G. 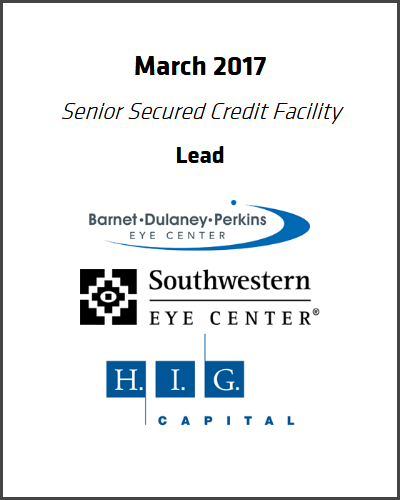 Capital's strategic investment in Barnet Dulaney Perkins Eye Center ("BDP") and Southwestern Eye Center ("SWEC"). AB-PCI was the sole lender in the transaction. Rob Wolfson, Managing Director at H.I.G. Capital commented, "The AB-PCI team was a great partner and worked diligently throughout the process, demonstrating sector knowledge, creativity, and the ability to provide flexible financing to ensure both transactions closed in an efficient and timely manner." "BDP and SWEC each have a strong regional leadership position, with excellent brand recognition that positions them well to continue to grow in the fragmented ophthalmology market. We are excited to partner with H.I.G. and management to support the next stage of evolution for the combined business, " noted Jay Ramakrishnan, Managing Director at AB-PCI. About Barnet Dulaney Perkins and Southwestern Eye Care: Headquartered in Phoenix, AZ and Mesa, AZ, Barnet Dulaney Perkins and Southwestern Eye Center are the leading eye care practices in Arizona offering a full range of clinical and surgical eye care. For over 30 years, the practices have been providing care to urban and underserved rural communities throughout the Southwest. AB Private Credit Investors (AB-PCI) served as Documentation Agent and was a meaningful holder of the term loan in a $225 million senior secured credit facility ($25 million revolver and $200 million term loan) that supported the management-led recapitalization of Priority Holdings, LLC. About Priority Holdings: Priority Holdings is the 8th largest U.S. non-bank merchant acquirer. The Company provides payment processing and business solutions to small and mid-sized businesses through its Priority Payment Systems brand and provides commercial payment solutions to larger, institutional clients through its Priority B2B brand. 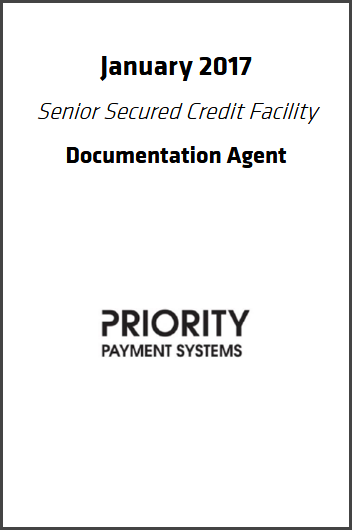 Priority Holdings is headquartered in Alpharetta, Georgia and is led by an experienced group of payments executives. AB Private Credit InvestorsTM ("AB-PCI") acted as co-lead arranger and serves as co-admin agent for a $195,000,000 senior secured credit facility for United PF Partners ("United PF"), the largest Planet Fitness franchisee in the U.S. with 63 clubs in nine states. United PF is a growth-oriented franchisee with significant room for new club development under its area development agreements. The company has opened four new clubs since closing of the transaction, and the credit facility provides funding to support future growth plans. 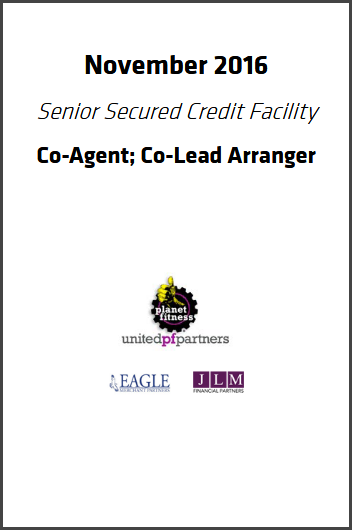 Eagle Merchant Partners and JLM Financial Partners created United PF by bringing together five leading Planet Fitness franchisees. Trey Owen will serve as CEO of United PF. About United PF Partners: United PF Partners is the largest Planet Fitness franchisee in the U.S. with 63 clubs and development rights to build new clubs across the Midwest, South and Mid-Atlantic regions. United PF currently operates clubs in nine states, including Alabama, Kansas, Louisiana, Mississippi, Missouri, Oklahoma, Pennsylvania, Texas and West Virginia. AB Private Credit InvestorsTM and its affiliates ("AB-PCI") provided debt and equity capital to support DataMentors, LLC ("DataMentors") in its acquisition of V12 Group (together with DataMentors, the "Company"). AB-PCI was the sole lender to the Company's senior secured debt facility. DataMentors and V12 Group provide data and marketing technology solutions that enable marketers to target specific consumer audiences across multiple channels. The combined company, now known as V12 Data, unites the strengths of two respected names in the data industry to deliver integrated, omnichannel data products to marketers. "We are excited to finance the combination of DataMentors and V12 Group and support management as they enter the next phase of growth", said Drew Miller, Director of AB-PCI. "The Company's unique data solutions provide a strong value proposition to a dynamic and growing market." 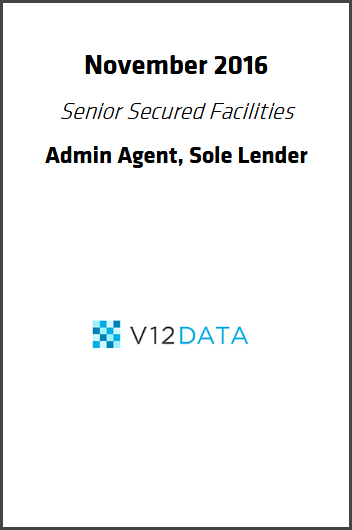 Anders Eckman, CEO of V12 Data, commented that, "AB-PCI stepped up and proved to be focused, responsive and creative in delivering a debt and equity package for us to complete this transformative deal. We look forward to their partnership for many years to come." The transaction represents AB-PCI's ongoing effort to provide capital to clients of vertically-focused and regional investment banks. JEGI, a leading independent investment bank for the global media, information, marketing, software and tech-enabled services sectors, headquartered in New York, NY, represented V12 Group in this transaction. 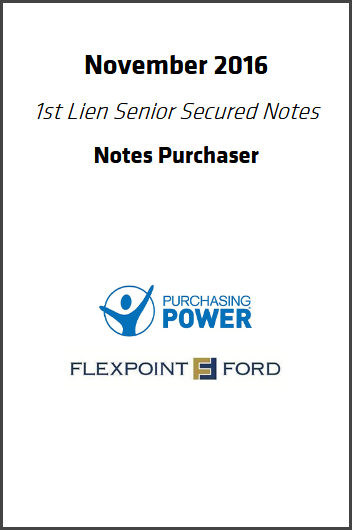 AB Private Credit InvestorsTM (AB-PCI) joined incumbent and new lenders to provide a New Senior Secured Note to support Flexpoint Ford, LLC, in its acquisition of Purchasing Power, LLC. AB-PCI is pleased to partner with Flexpoint Ford and management, and looks forward to supporting the Company's continued growth. "The Company's unique business model delivers a strong value proposition to its customers and their employees," said Daniel Weiss of AB-PCI, "We are excited to help finance the Purchasing Power acquisition and support management as they enter the next phase of growth." About Purchasing Power: Purchasing Power, LLC, is one of the fastest-growing voluntary benefit companies in the industry, offering a leading employee purchase program for consumer products and services as well as providing financial tools and resources to improve employee financial wellness. Purchasing Power is available to millions of people through large companies including Fortune 500s, associations and government agencies. Headquartered in Atlanta, Purchasing Power is 'Powering People to a Better LifeTM' through its employee purchase program, financial literacy efforts and corporate social responsibility initiatives. 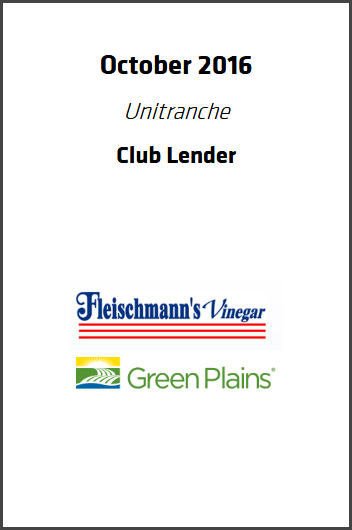 AB Private Credit Investors (AB-PCI) participated in a senior secured, unitranche credit facility to support the acquisition of Fleischmann's Vinegar by Green Plains, a publicly traded company. AB-PCI was among a group of lenders that provided a $130 million term loan and a $15 million revolving line of credit. AB-PCI is pleased to partner with Management and Maranon Capital, L.P., the Agent, and looks forward to supporting the Company's continued growth. About the Company: Fleischmann's Vinegar is an all-natural specialty ingredients company serving a range of markets and end-use applications, including: food and beverage ingredients, antimicrobials, bio-herbicides and cleaning products across the food, beverage, agricultural, industrial and wholesale markets. AB Private Credit InvestorsTM and its affiliates led a senior secured financing to support Keg Logistics, a Bregal Sagemount portfolio company, in its acquisition of Atlas Keg. AB-PCI was the sole lender on the transaction. "We believe that Keg Logistics offers a unique value proposition to the craft beer industry, and the combination with Atlas further positions the Company for growth and solidifies its market position," said Jay Ramakrishnan, Managing Director of AB-PCI. "We are excited to partner with Sagemount and the management team of Keg Logistics in the acquisition of Atlas Keg." Gene Yoon, Managing Partner of Bregal Sagemount, commented that, "AB-PCI was thoughtful and responsive on a short timeline. More importantly, they proved to be a partner in the true sense of the word, providing us the structure and flexibility necessary to meet the nuanced needs of the growing company." Keg Logistics is a leading provider of keg and equipment financing to breweries and wineries globally. Keg Logistics provides its customers with a flexible pathway to owning their own kegs, and maximizing their growth and profitability. In addition to financing solutions, Keg Logistics also manages both domestic and international logistics, as well as 3PL support. For more information, please visit www.keglogistics.com. AB Private Credit InvestorsTM ("AB-PCI") leveraged its history and expertise in underwriting high growth technology companies to provide a meaningful portion of a unitranche facility to support Vista Equity Partners' acquisition of Ping Identity. 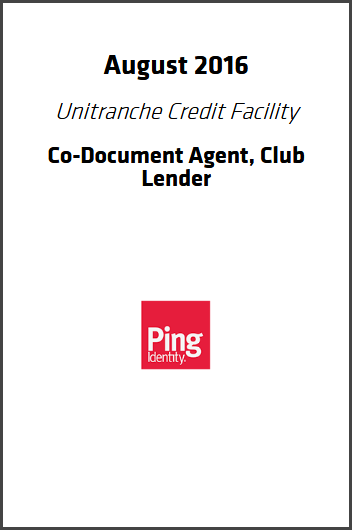 Shortly following the initial acquisition of Ping Identity, AB-PCI, along with other incumbent lenders, provided incremental financing to support the add-on acquisition of UnboundID. Ping Identity is the leader in Identity Defined Security for the borderless enterprise, protecting over 1.3 billion identities from data centers around the globe. With the addition of UnboundID and its capabilities of managing identities at large scale, the Ping Identity Platform will deliver the most complete solution in the Identity and Access Management market. AB Private Credit InvestorsTM ("AB-PCI") leveraged its strong expertise in data centers to provide a fully underwritten second lien facility to support the Digital Bridge-led acquisition of DataBank. 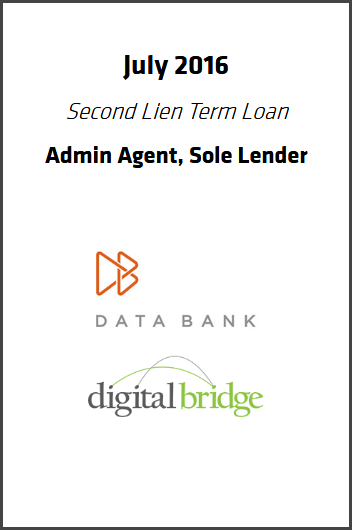 AB-PCI was pleased to partner with Digital Bridge and work with the first lien lenders, led by SunTrust, in connection with this transaction. AB-PCI also invested alongside Digital Bridge in the equity. "AB-PCI is experienced financing growth businesses across the communications /IT infrastructure sector and was quick to appreciate the strong historical performance and strategic plan for DataBank. They executed very efficiently and offer a sizeable capital base to support our long-term growth strategy. I look forward to partnering with them to scale the platform." Tom Yanagi, Managing Director Digital Bridge, LLC. DataBank is a leading provider of enterprise-class data center services offering colocation, managed, cloud and network solutions from six facilities in Dallas, Minneapolis and Kansas City. AB Private Credit InvestorsTM ("AB-PCI") leveraged its strong expertise and knowledge in the software sector to efficiently provide a unitranche senior secured financing facility to support the momentum and future growth of the business. 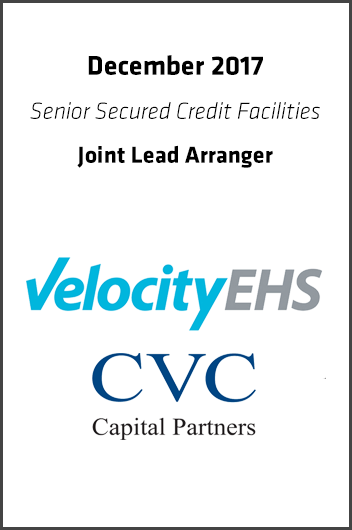 AB-PCI was pleased to partner with Vista Equity Partners in connection with this transaction. 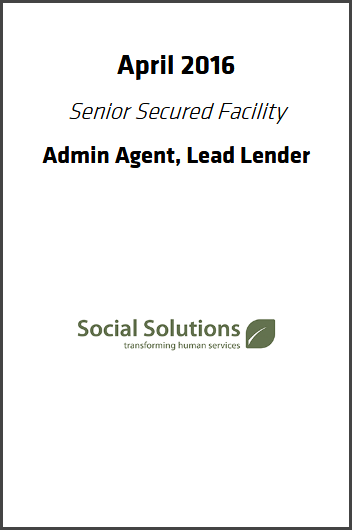 Social Solutions is a leading SaaS-based performance and case management software solution for the human services sector. 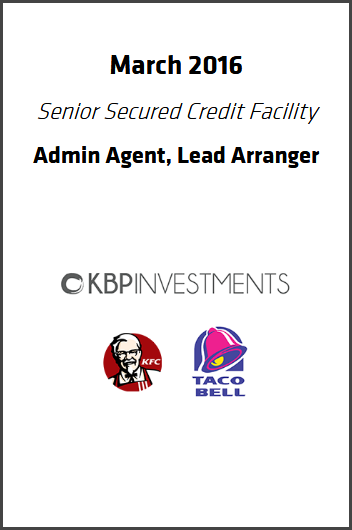 AB Private Credit Investors ("AB-PCI") provided a $146,500,000 senior secured credit facility to KBP Foods ("KBP"). Use of proceeds includes refinancing KBP's existing debt, funding a recent acquisition of 91 KFC and Taco Bell restaurants, and funding future growth. Bob Bielinski, Managing Director of AB-PCI, said, "Best in class is an overused term today, but Mike Kulp and the KBP team are truly best in class operators. Their track record of improving operations at acquired businesses is unmatched." Michael Kulp, President and CEO of KBP said, "Not only did AB-PCI provide financing for a very significant acquisition, but they also provided the flexibility and support necessary to allow us to continue to execute our business plan and invest in assets. They understood the opportunity in front of us and delivered the capital we need to continue to grow." 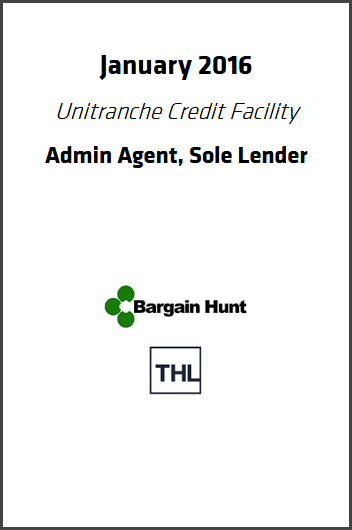 AB Private Credit Investors (AB-PCI) provided a senior secured, unitranche credit facility to support the acquisition of Bargain Hunt Superstores by Thomas H. Lee Partners (THL). AB-PCI is the sole lender on the transaction. "We are pleased that we were able to partner with THL and the management team of Bargain Hunt," said Bob Bielinski, Managing Director of AB-PCI. "Bargain Hunt has unique sourcing expertise that allows it to offer exceptional value to consumers and sellers of secondary market inventories." Douglas Haber, Director of THL said, "AB-PCI stepped up with meaningful capital in a short period of time. They understood the company's market opportunity and provided a flexible financing solution which will help facilitate the company's future growth initiatives." About Bargain Hunt: Bargain Hunt is an extreme value retail chain that enables customers to buy quality brand name merchandise at prices well below normal retail. Bargain Hunt currently has stores in Tennessee, Kentucky, Georgia, Alabama, Indiana and Mississippi. 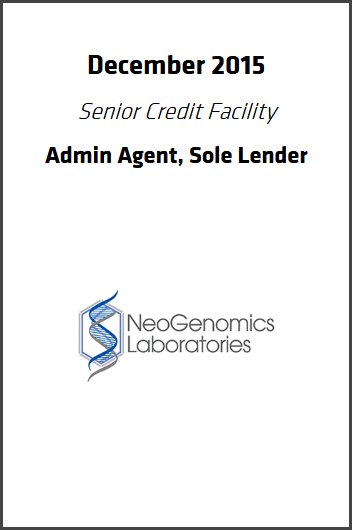 AB Private Credit InvestorsTM and its affiliates ("AB-PCI") provided, on a sole lender basis, a $55.0 million senior term loan backing NeoGenomics' acquisition of Clarient, Inc. from GE Healthcare. Steven Jones, Executive Vice President, Finance, said "The AB-PCI team was commercial, responsive, knowledgeable in healthcare and moved swiftly to provide commitments in a rapid time frame ensuring smooth execution of the transaction. AB-PCI will remain an important strategic partner for us going forward." NeoGenomics, Inc. is a leading provider of specialized and comprehensive cancer genetic testing services to hospitals, physicians, and the pharmaceutical industry through its network of CLIA-certified clinical laboratories. 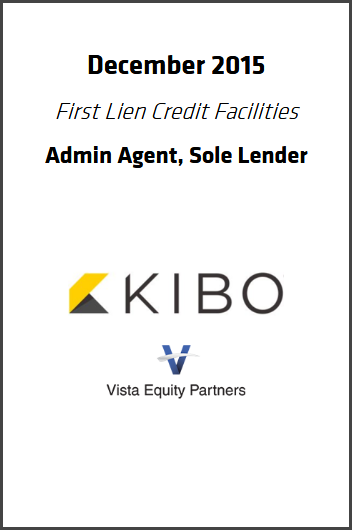 AB Private Credit Investors provided a senior secured, unitranche facility to support Vista Equity Partners' creation of Kibo Software via the strategic acquisitions and merger of Marketlive, Shopatron and Fiverun. AB-PCI acted as the lead and sole lender on the transaction. AB-PCI's sizeable capital base, expertise in software, and structuring flexibility enabled us to provide a full commitment for the financing and ensure a successful close. About Kibo: Kibo is the strategic merger of industry leaders Marketlive, Shopatron, and Fiverun. With a combined 40 years of innovations, Kibo is joining forces to help retailers and branded manufacturers unify the consumer experience. Kibo is a complete omnichannel commerce platform, delivering the lowest total cost of ownership and the fastest time to value.